My deepest apologies loyal readers for my tardiness in posting. Since the cutting of the tops of our tomatoes it is like we are reliving our August harvests. 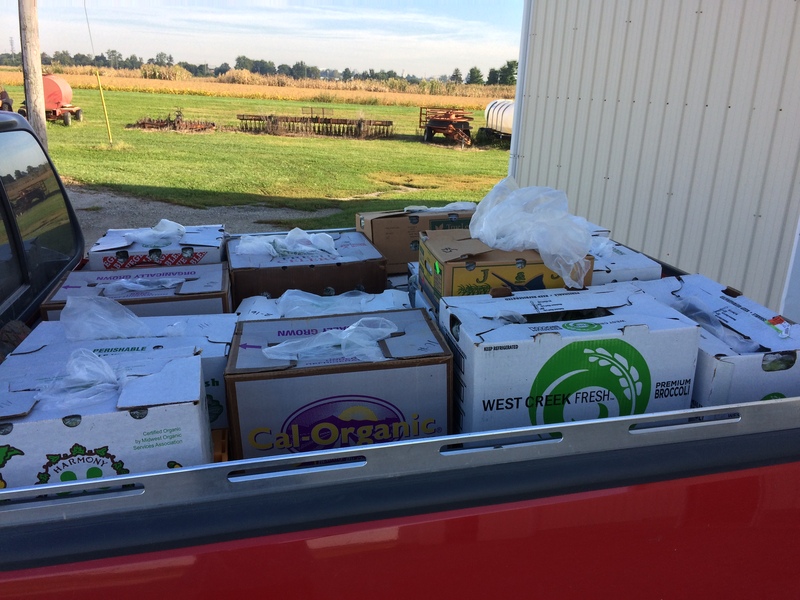 I have had to make multiple trips from the farm to campus because I couldn’t fit everything in the truck. It is a nice strong finish. 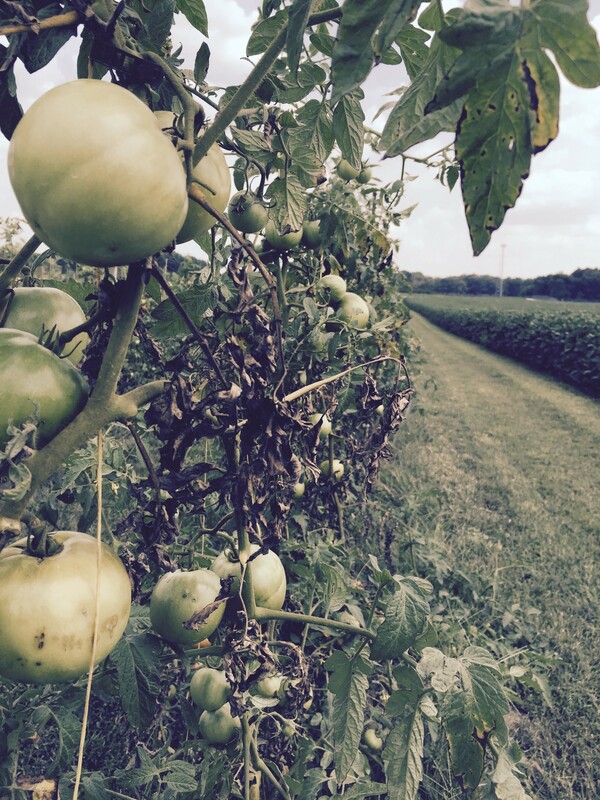 We are in the midst of doing duel harvests, ripe tomatoes and green tomatoes. This will be the last week then adios!! since the student farm (next door neighbor) told me they hardly got anything off of theirs due to black rot. We will talk about the black rot in a min. First I would like to go on and on about this beautiful kale! I have never had luck in the past with this crop. Usually I plant it in the field when we plant our other crops in May. The kale has never survived through the summer. I thought it was because of the heat so I purposely waited until the end of July to seed it in the greenhouse and then finally put it in the field beginning of August. This sells for the same price as 1st tomatoes so this is a big win for the farm! The student farm is nice enough to let us borrow their wash/ pack station during the week. Not only does this make life easier for us at the farm but it is also very educational. I cherish this time because I get to interact with the student farmers and we get to compare/ contrast successes and failures of certain crops and methods. It is imperative to get advice and communicate with other farmers because it ultimately makes you better at what you do. On one of these occasions, I learned about black rot. I didn’t know this disease existed although I had seen it over the years. What I thought was heat damage was really black rot. Black rot is a bacterial/ fungal disease that causes decay in the leaves or fruit. 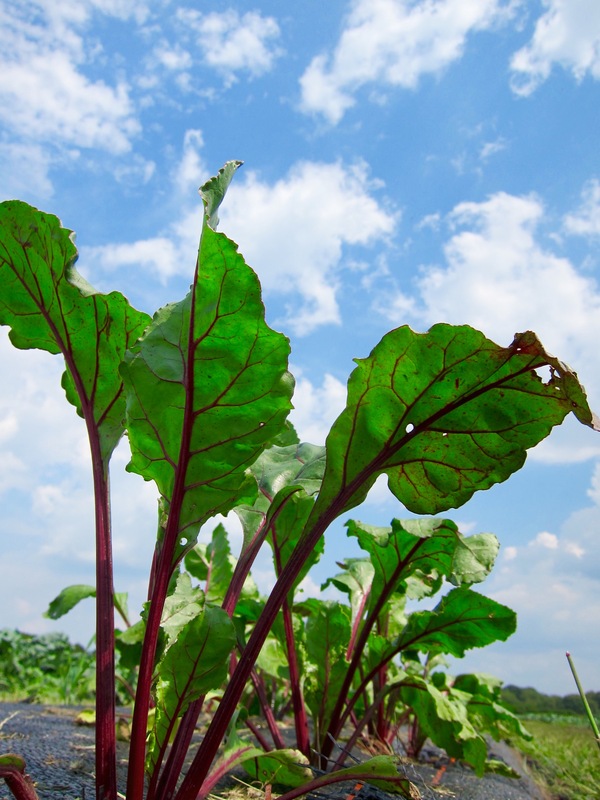 It can affect apples, grapes and brassicas (kale, broccoli, cabbage, cauliflower etc). Matt (head of student farm) told me there is really no cure… which is super annoying sort of like something else I know…… BACTERIAL SPOT. 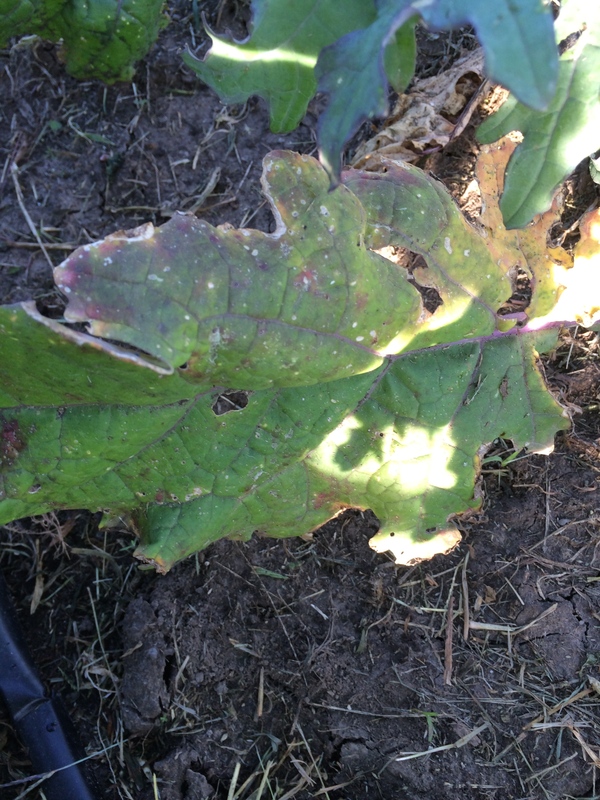 Luckily I have only seen small signs of it and we immediately removed the diseased leaves from the plant. I wish the broccoli would hurry up before something catastrophic happens to it. 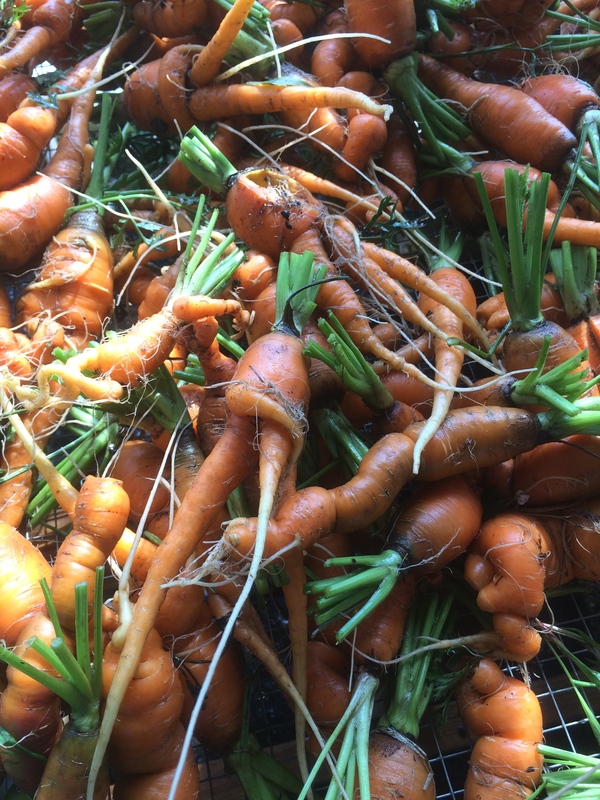 In other news….. we pulled the last of our carrots. They were a little weird looking, meaning they were spindly, but washed up nicely. 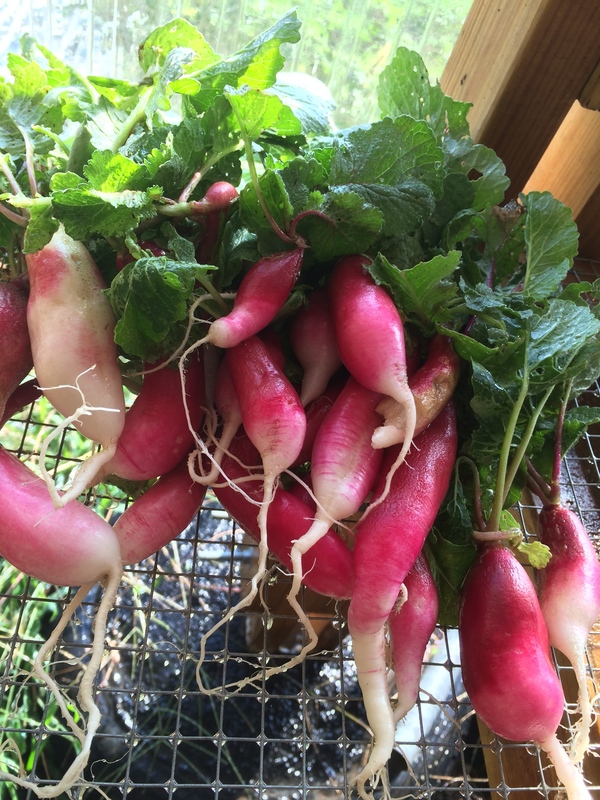 We also had a nice harvest from our fall radishes. I was getting a little worried because the green tops were huge but there was nothing there when I pulled a couple from the ground. I asked some farmers about it and they said they think it has something to do with moon cycles. I think I need to do a little more research on that one 🙂 . Peppers are still chugging away. They aren’t great (due to lack of crop rotation) but they aren’t horrible. I will keep them in the ground as long as they are producing something. We had an exciting Saturday at the farm this past weekend. 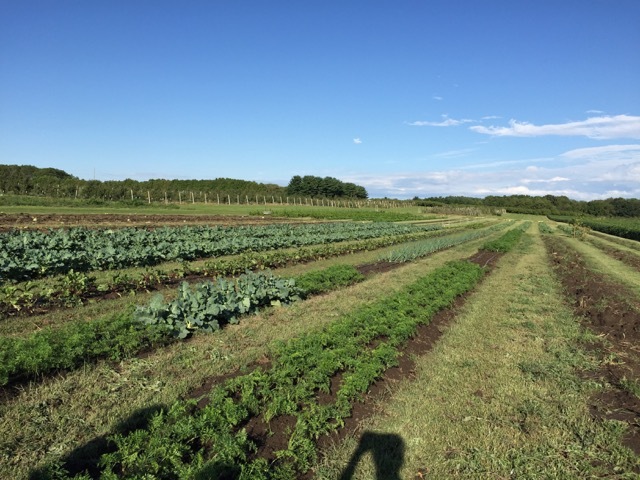 I received a phone call from my friend Erik, who farms the plot next to mine. He alerted me to the fact that my crops were being harvested without my knowledge. 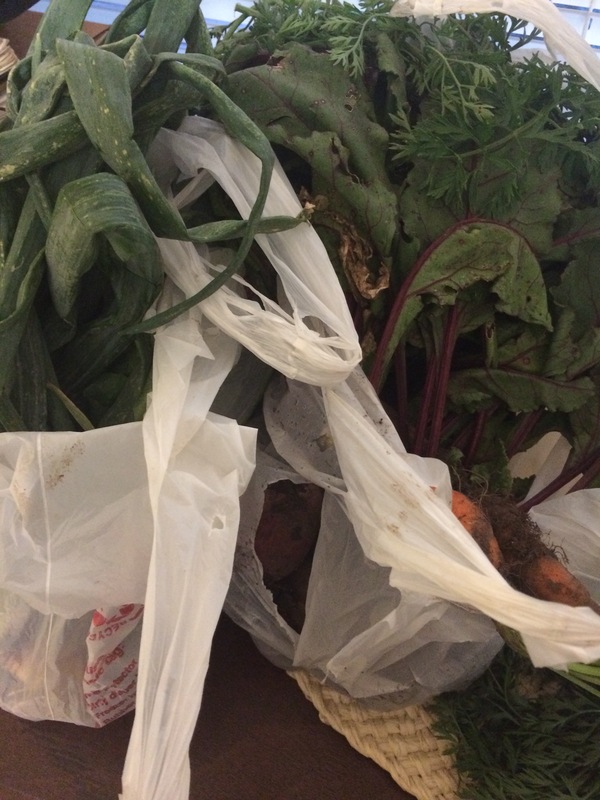 I raced to the farm, thankfully I only live two minutes away, and low and behold there were two girls in the middle of the farm with four full bags of produce and pulling a wagon. These girls were students at the U of I, well dressed and well spoken. There might have been a different outcome if the people taking the crops were doing it for survival. That however, was not the case! After our confrontation was over I was able to salvage most of the produce stolen. Let me be very clear on this…… Stealing produce is STEALING, just like robbing a bank is STEALING and taking something that doesn’t belong to you without permission is STEALING! Farmers work very hard and every dollar counts. I will be on high alert (with night vision goggles 🙂 ) until this years growing season is over from now on. We cut the tops of our tomatoes as promised which focused the energy away from developing new growth and put it into ripening the hanging fruit. 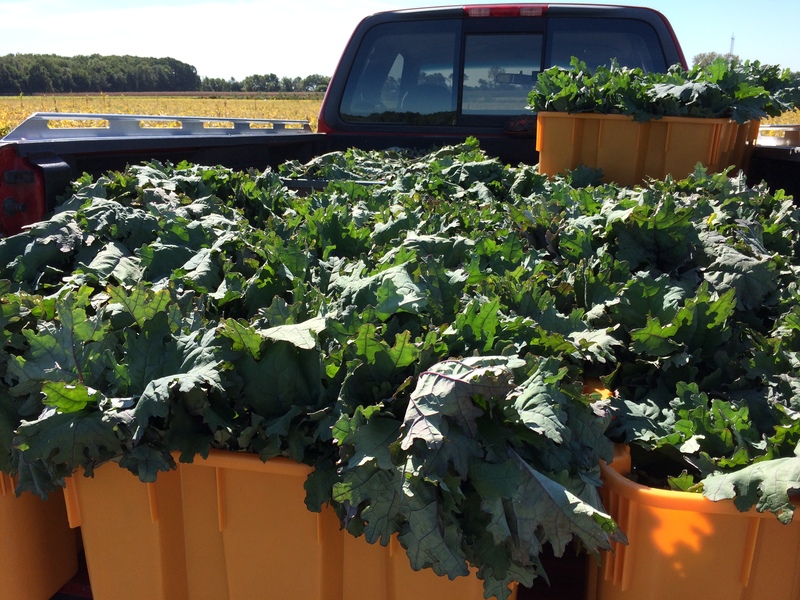 We had a lovely harvest today, finally getting some good quantity to deliver out to campus. I am predicting we will have one more red tomato harvest on Thursday and then we will start harvesting the green tomatoes next Monday. I have warned the chefs to get ready for a very heavy green tomato menu for one week and then it will be over. I have to say that I am not sad to see the end of this tomato season. It finished with disappointment again. I was asked “Wasn’t last year a bad season for tomatoes as well? Maybe you should look at growing a different crop.”. 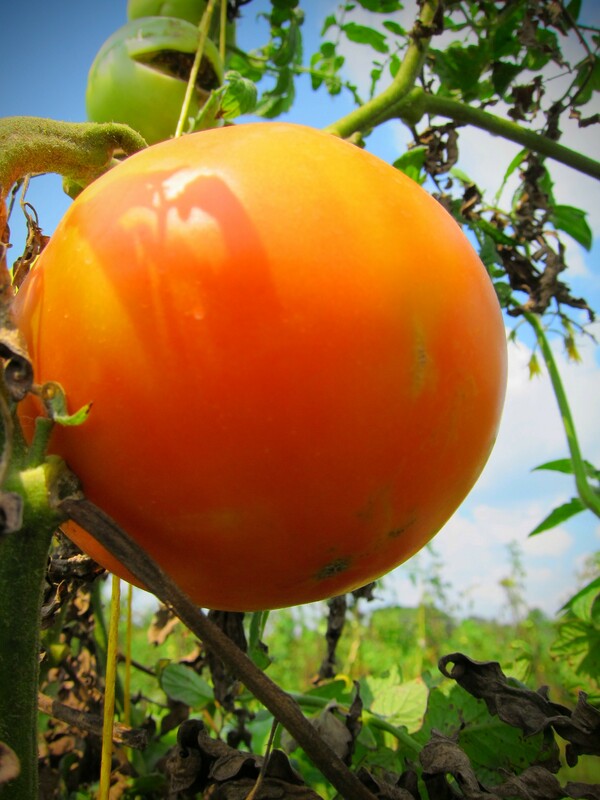 Yes, we have had a terrible season for tomatoes two years in a row with heavy and frequent rains throughout the beginning of the growing season and unusually cool temperatures during the summer. 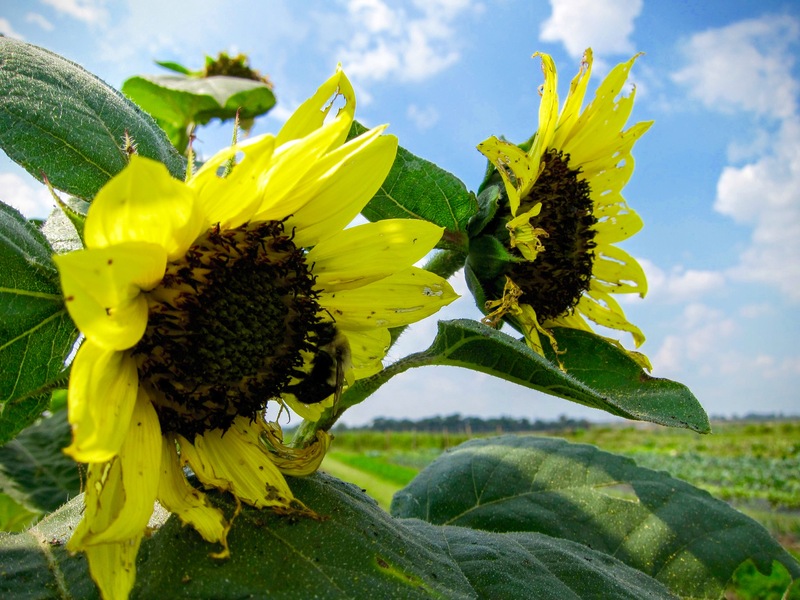 Looking back I think there were two consecutive really hot weeks this growing season which proves to be a problem when growing warm season crops. I can not control the weather so I won’t be able to fix that. The bigger factor was that there was no crop rotation because the land I am farming had tomatoes growing all over them last year. Although we had a prevalent amount of disease last year due to the massive amount of rain, this year was by far worse. My hands were tied as far as the crop rotation goes for this year. Farmers… listen to your educators when they say rotate crops! They were not lying :). 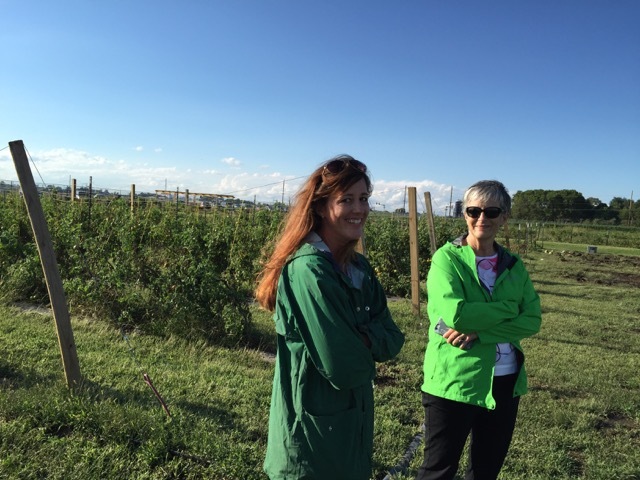 Tomatoes are a huge and important crop for this project. They are the base for many things that are served throughout the school year and they are by far the most used piece of produce. Not growing them is simply not an option. I can only hope that next year with crop rotation, changing varieties and hopefully less rain in the beginning of the season we can pull a decent crop. 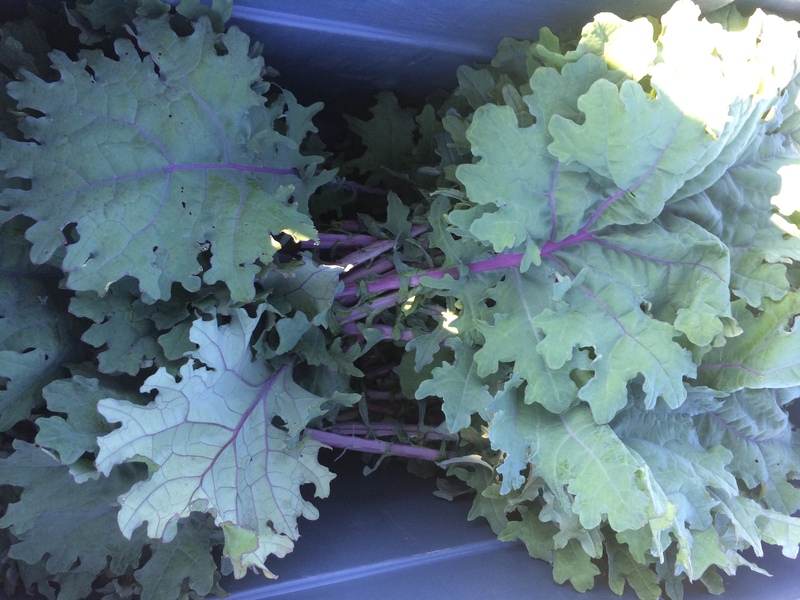 Our fall crops are still looking good and the kale is big and beautiful. 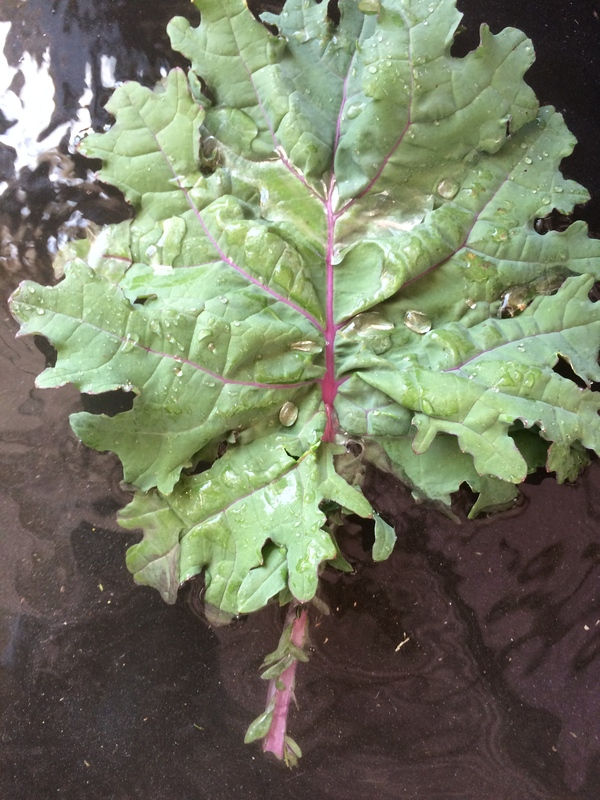 For those of you who are new to the blog this year I had a rough go of things regarding our kale in previous years. 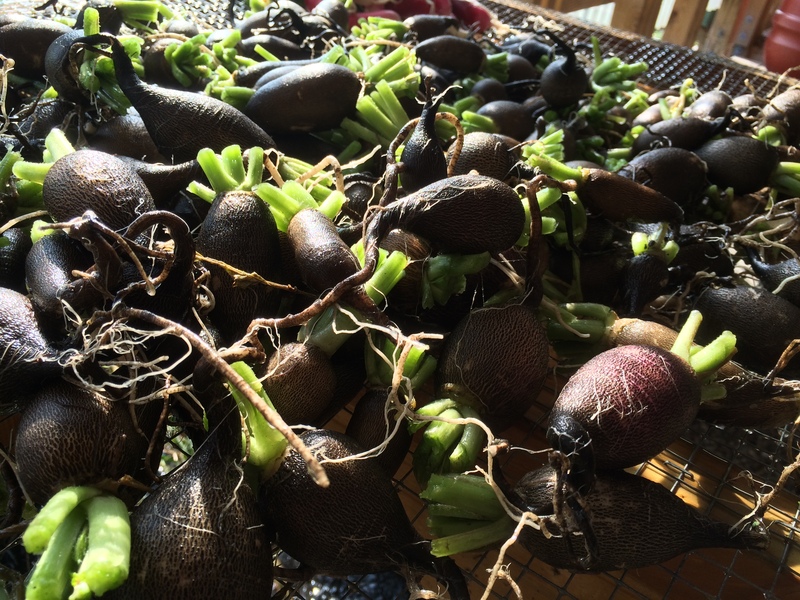 This year I waited until late July to seed transplants in the greenhouse and planted it in the field in August. It puts off such a magnificent spicy smell when harvesting it in the mornings. . Glorious! 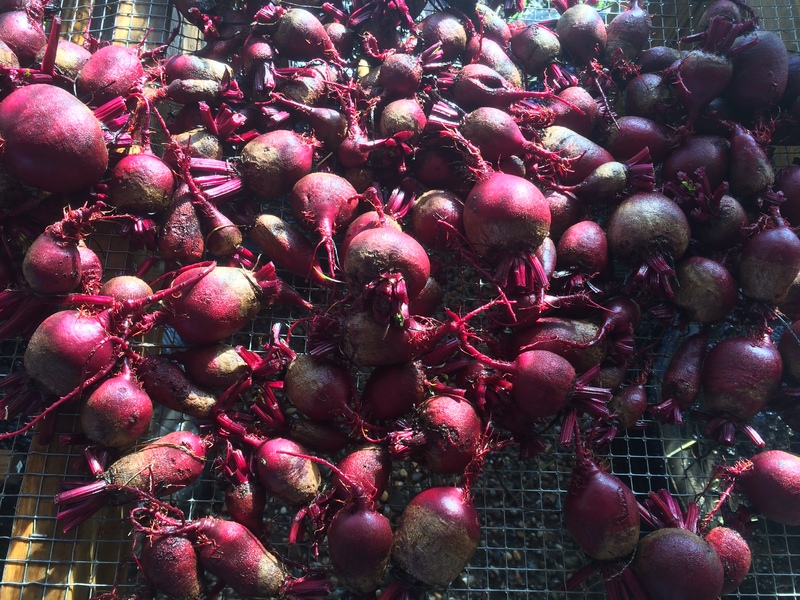 I harvested the last of the beets today. I couldn’t believe how popular they were with the chefs and students. Beets are usually a hit or miss, meaning a lot of the time the people who hate them are completely put off by their earthy flavor and (depending how they are cooked) their texture. I was pleasantly surprised. Although they weren’t super profitable they added a great diversity to the farm produce that was available to the chefs this year. I took a few pictures after I rinsed them because I was in complete awe of their beauty. I know… super cheesy but it was the truth. They were a vibrant deep magenta similar to the color of the center of a blood orange, which I love. The chefs have been making some fabulous things with the produce they have been receiving. 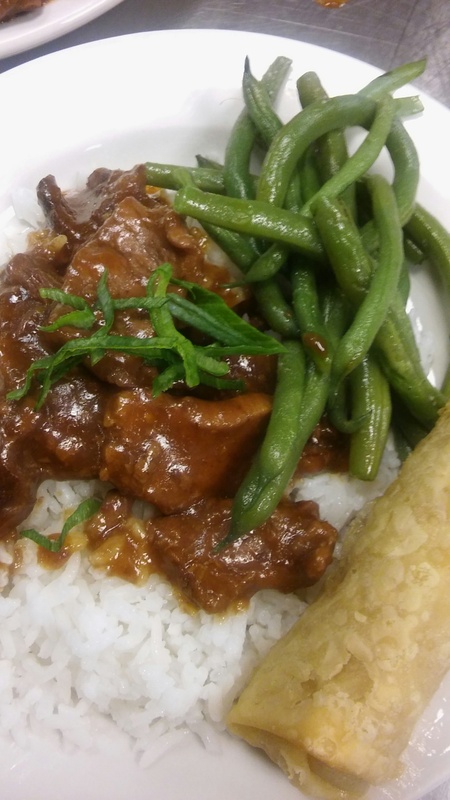 Antonio at Pike made a Mongolian beef using HH farm peppers and green beans for a side. 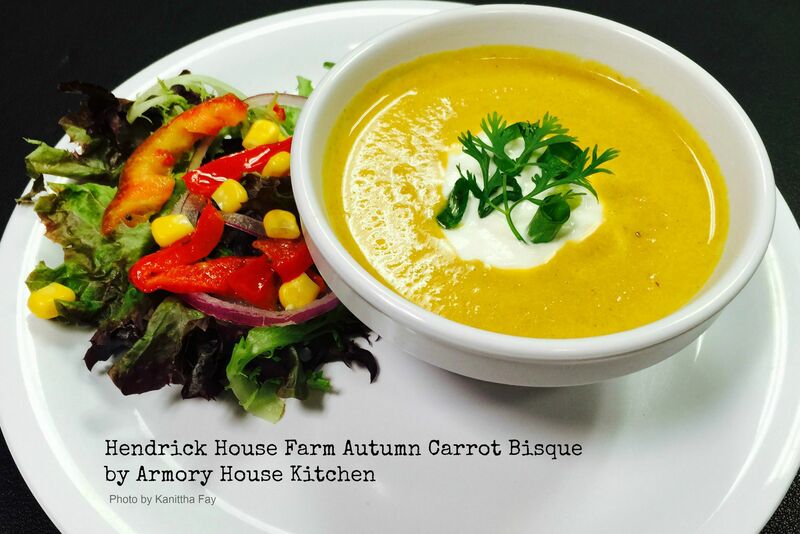 Liz at Armory made HH farm carrot bisque. Scrum diddly umptious! Watermelon, we will see each other again! The crisp fall air is here. Air conditioners are off and pumpkins and fresh pressed cider are on the brain. Unfortunately this means the end for the tomatoes. I am planning to clip the tops at the end of this week so all of the fruit hanging will ripen and we will get one more big harvest. As the tomatoes had an underwhelming season this year the watermelon did fantastic. Aside from the squash they were this year’s winner. 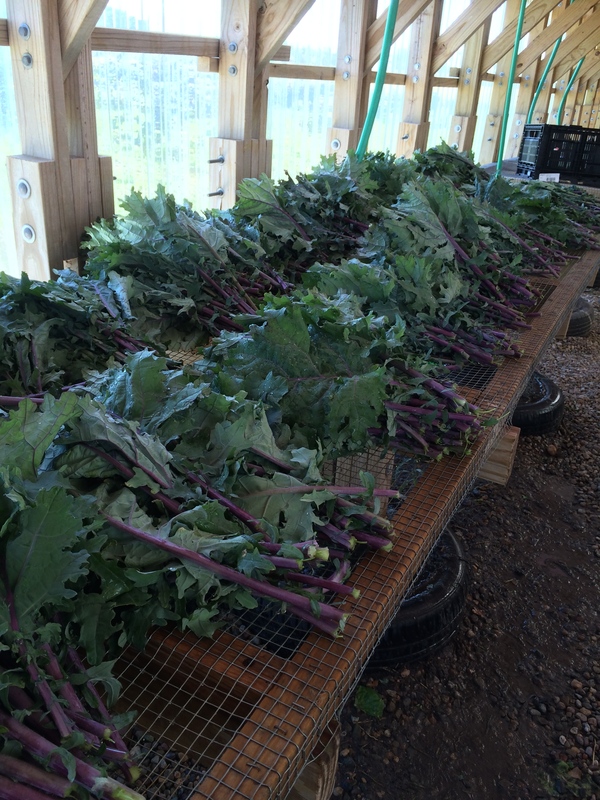 We harvested over 500 melons from four 180ft beds and had positive response from the chefs and students. We will definitely be seeing this crop again! 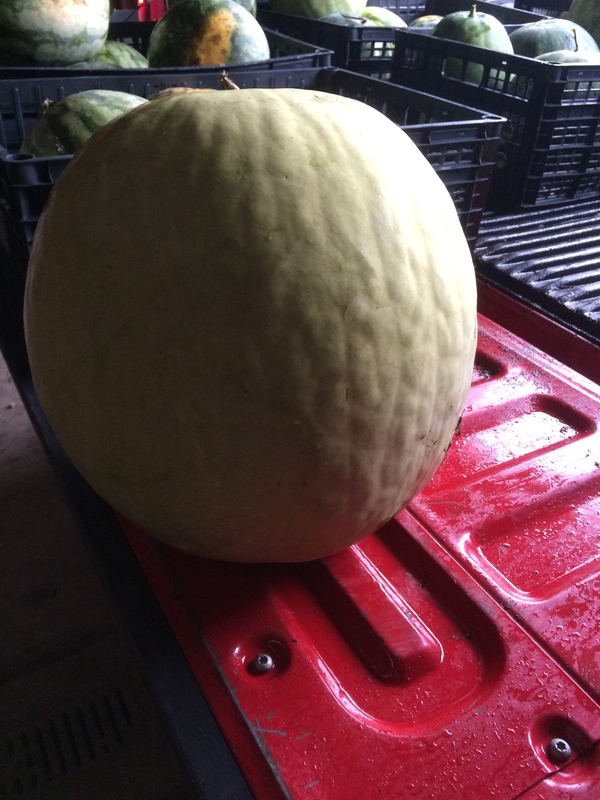 The last and biggest melon of the season!! 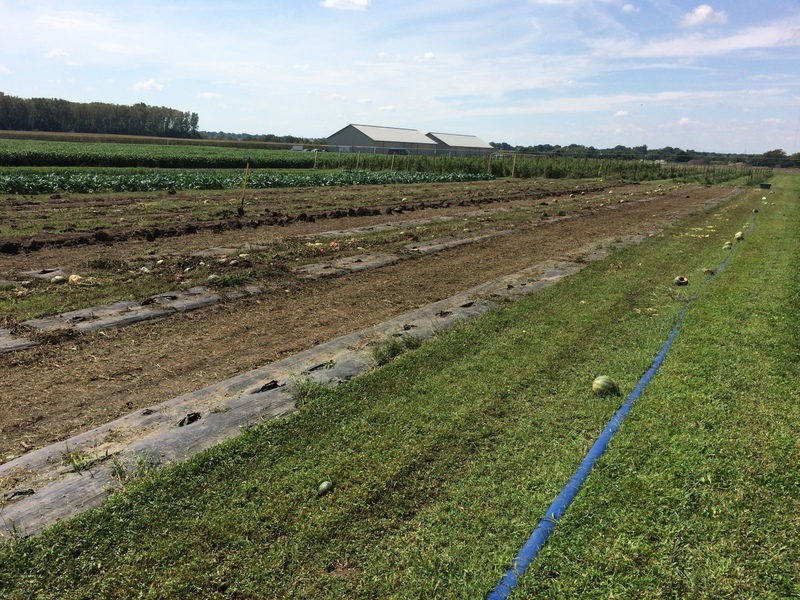 Sarah and I took advantage of the wet ground and were able to rip out the plastic and drip in the melon and squash beds. I plan to clean as we go so it doesn’t seem like such a daunting task in November. The fall crops are here!!! The fall crops are here!! I hope everyone had a safe and happy Labor Day weekend. The farm celebrated by taking the day off hence why this post is a day late…. but not a dollar short! I’m not sure what is going on with our tomatoes but I called in some experts today in search of advice. We had two solid weeks where we were pulling over 1,000 lbs off the plants and then, in true Illinois fashion, we had a cold week and the plants stopped producing. 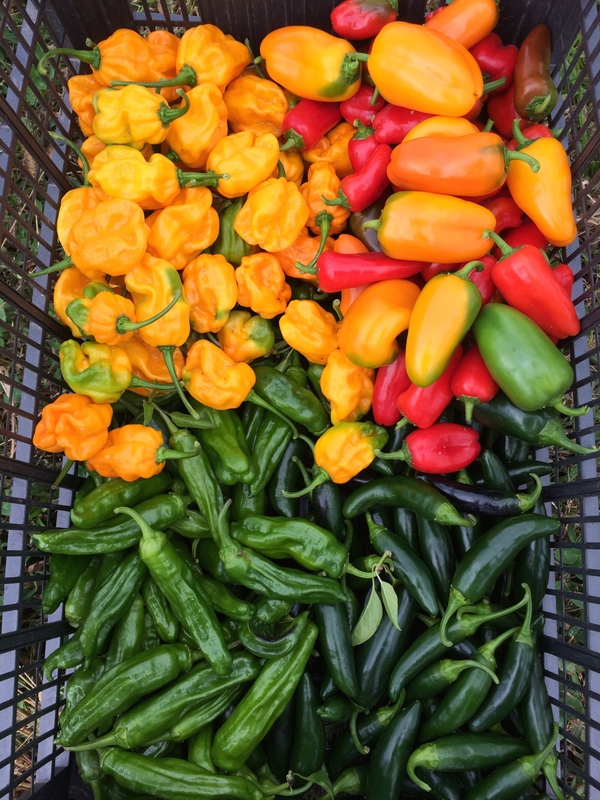 It was hot last week and over the weekend so I thought that would bring them back but we had a very light harvest again today. 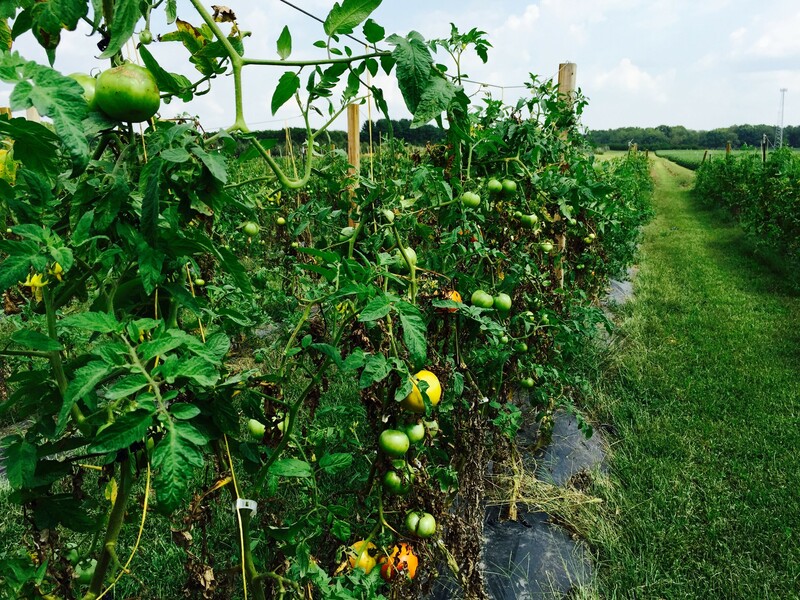 There are still a lot of green tomatoes hanging on the plants but as the season progresses I am nervous that these much needed hot days will begin to disappear. I guess we will just have to wait and see. I started harvesting the romaine beds last week so I could stretch it out and have supply for a two week time period. I went to harvest the remainder of the bed today and it was riddled with bug damage. I managed to strip out a majority of the damage so it would still be marketable but I am going to have to rethink this plan for the next go around which will be in two weeks. We had our first big harvest of our fall crops today. 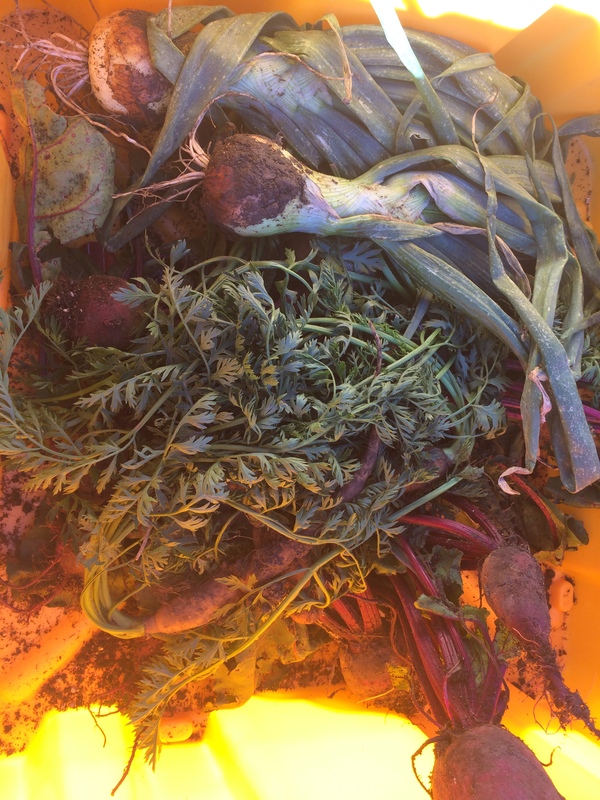 Carrots and beets were among the vegetables pulled from the ground. 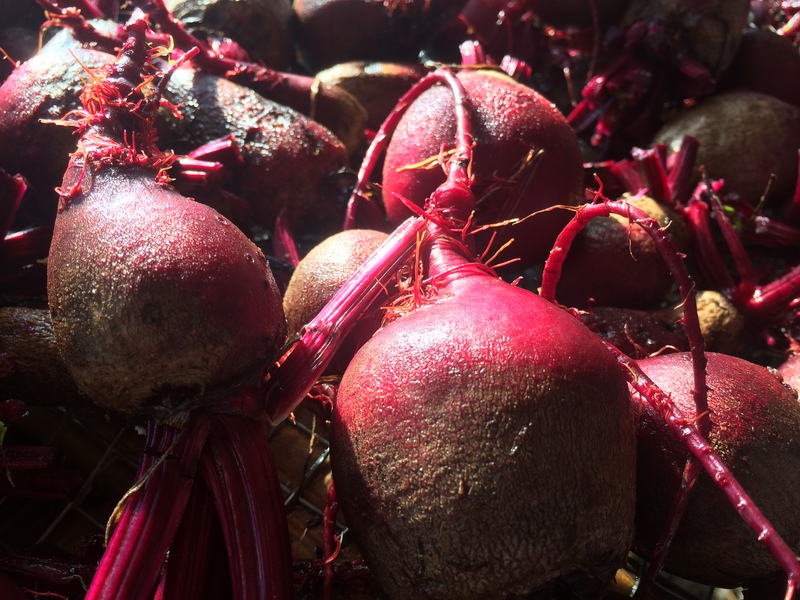 Our beets were big, beautiful and red while our carrots were, umm, beautiful in a growers eyes! 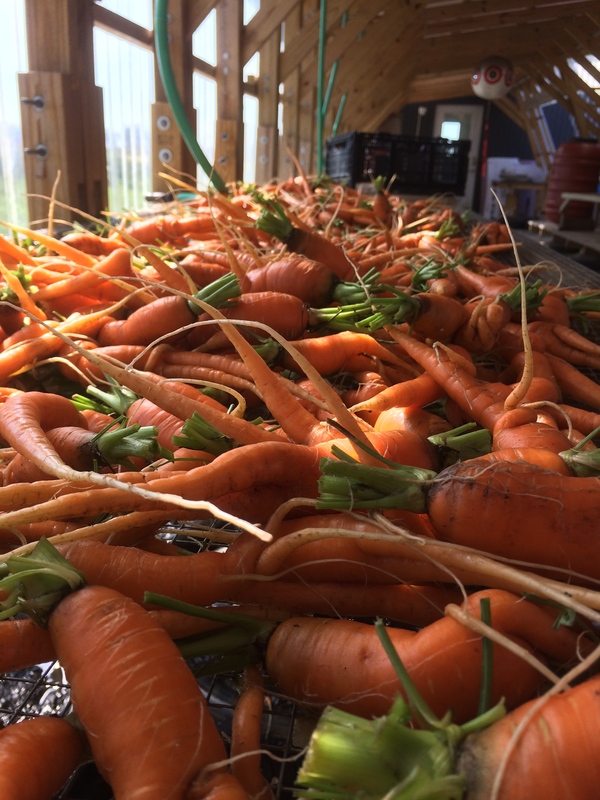 They were slightly deformed looking so I asked Matt Turino, head of the student farm, and he said carrots are tricky to grow. 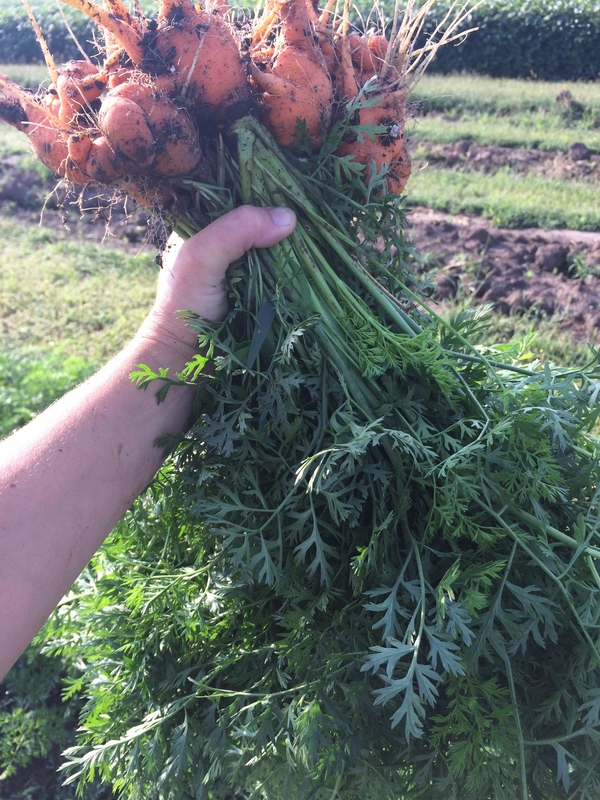 If the bed is not constantly weeded the carrots will grow around the weeds with a final result being what I harvested today. Sarah and I do a really good job of keeping the farm weeded so I was surprised to hear this news. My original plan was to grow mirepoix (celery, carrots and onions) with the extra land because chefs use this as a base for pretty much everything but this may be a crop that just isn’t worth the money if they are that labor intensive. I am nervous to see how the chef’s respond to them when I deliver them in the morning. They will be difficult to peel but I think they are high enough quality that the chef’s won’t have to. Our kale is big and beautiful and our broccoli is developing exquisitely. 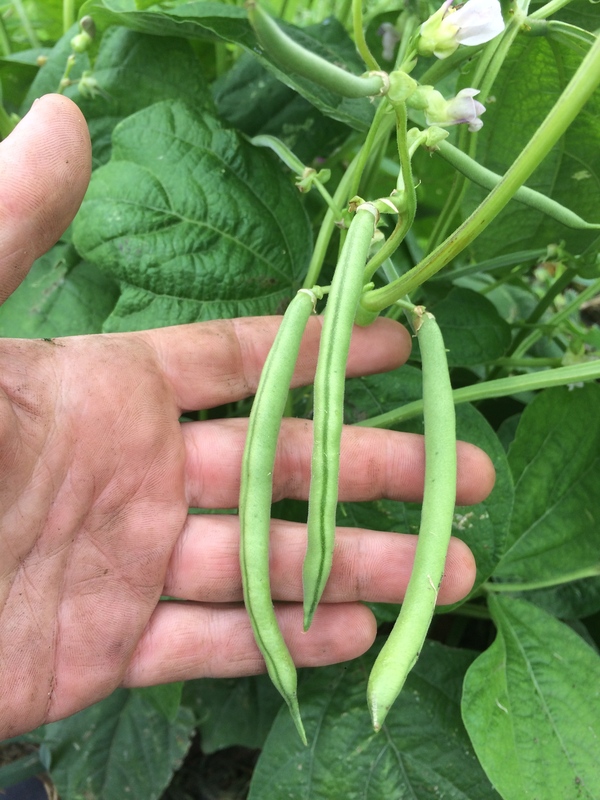 I spotted some green beans on the plants today and we will start to harvest off of them early next week. 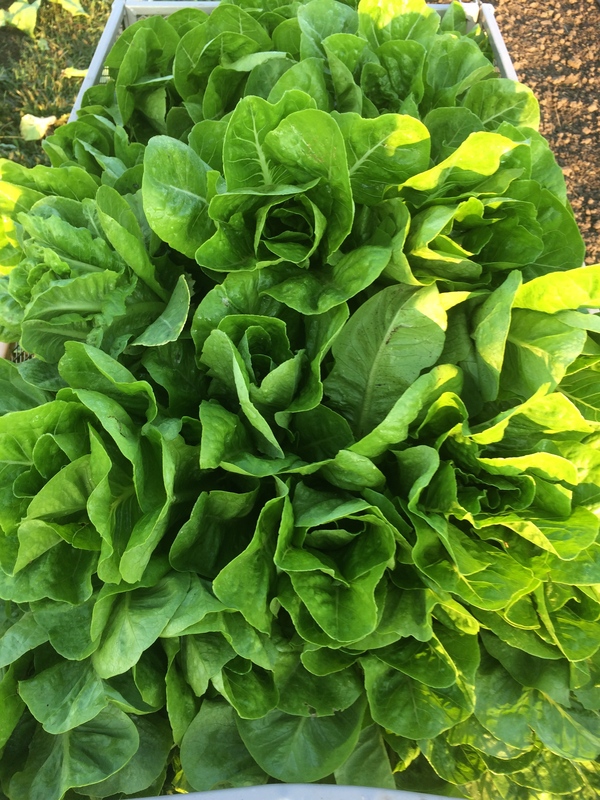 We have two more rounds of romaine, one to be harvested in two weeks and one to be planted in a week or so. That will be the last planting of the season. Our watermelon is finally finished and I am more than pleased with the value of that crop. Sarah and I are going to start slowly dismantling the beds that are finished so we aren’t racing against the first frost of the season to break down the farm. It seems like this season flew by! !